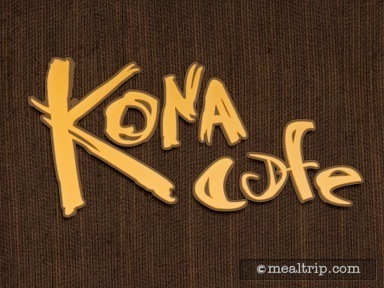 The Kona Cafe at the Polynesian Resort is most Cafe-like at lunch! The popular table-service location is situated on the second floor of the main ceremonial house (the same level the monorails are on). While not being a quiet place to enjoy dinner, the hustle and bustle in the connecting lobby walkway seems to be more acceptable at lunch. If you arrive late in the “lunch” dining period, it may actually seem a bit more peaceful than at dinner. Food-wise, there’s a good selection of sandwiches, salads, and tacos that fall into the American cuisine category, with a few island tropical and/or Asian garnishes tossed in for good measure. There’s even a couple of traditional Asian dishes like the popular Asian Noodle Bowl and several Sushi selections.